Just a minor population of late-season weeds can ruin a whole load of soybeans. For most commodity soybean producers, this is not a major concern. However, for those who produce premium beans such as food-grade soybeans, light-coloured edible beans, or bean seed, late-season weeds can mean the difference between earning a premium and sending the beans to the crusher. Eastern black nightshade can have deadly effects on a crop of IP soybeans and is a problem best addressed before planting. Photo courtesy of Mike Cowbrough, Ontario Ministry of Agriculture, Food and Rural Affairs. Weed seeds can contaminate beans if they are of similar size or if sticky weed juices adhere weed seeds to the beans, says Dave Bilyea, weed science technician at the University of Guelph’s Ridgetown Campus. This is a concern because of restrictions against the import, export and sale of certain regulated weed species. For example, giant ragweed has seeds that are difficult to separate from soybeans and is considered a noxious weed in areas of Canada. Cleaning the beans is unlikely to remove the contaminating seeds. The residual stain in the combine could also affect subsequent loads. Weeds that remain green at harvest such as lamb’s quarters can leave subtler green stains. Staining from green or partly green weeds is compounded by combining when there is excess moisture in the field such as early or late in the day, says Mike Cowbrough, Ontario Ministry of Agriculture, Food, and Rural Affairs weed management program lead for field crops. The moisture rehydrates some of the plant and helps to spread stain-causing substances. Weeds can also exacerbate mud tagging, says Bilyea. Horsenettle, smooth ground cherry, clammy ground cherry, biennial wormwood, and Canada fleabane, for example, emit sticky juices or resins when crushed. The sticky juices, as well as moisture from precipitation or dew, can mix with dust and stick to the beans. This gives the beans a dingy appearance. Another potential red flag noted by Bilyea is plants like catnip or field mint, which can infuse the beans with an unwanted aroma. Staining or contamination by the berries from weeds such as eastern black nightshade (A) and pokeweed (B) and the green tissue of others such as lamb’s quarters (C), can reduce marketability versus the appearance of clean soybeans (D). Photos courtesy of Dave Bilyea, University of Guelph Ridgetown Campus. If the beans do not meet the colour requirements, they do not receive the premium. “A fairly well-stained load just wouldn’t make the grade,” says Barclay. “Depending on the year, it would either get rejected to crusher beans or it could go to a nongenetically modified soybean market.” So it is imperative to address weed issues before harvest. In fact, late-season weed issues are something that growers should consider even before spring, when they are planning their planting regime and weed control program, suggests Cowbrough. He says that many late-season weeds can be controlled by a late-season burndown with Reglone (diquat) or Roundup (glyphosate). 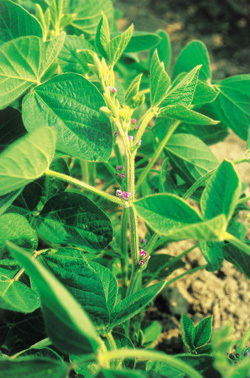 However, with eastern black nightshade, “you might get the plant to dry down, but you won’t get the berries to dry or drop.” If eastern black nightshade cannot be controlled in a field early in the growing season, Cowbrough suggests that growers should plant identity-preserved soybeans elsewhere. OMAFRA recommends that growers scout their fields for weeds and volunteer crops so that they can stay on top of any problematic species. One place where Bilyea says that weeds can hide out is at the perimeter of fields, where they could end up being caught by the combine head during harvest. So it can be beneficial to check and clean the field’s perimeter before berries develop and/or prior to harvest. Within the field, the combine operator should avoid harvesting specific areas that are particularly weedy. Not only is eastern black nightshade potentially poisonous, its berries can wreak havoc at harvest by staining light-coloured edible beans and soybeans in the combine. Killing this weed using a late-harvest burndown will not solve the problem because the berries tend to remain on the standing plant, says Mike Cowbrough, weed management program lead for field crops for the Ontario Ministry of Agriculture, Food, and Rural Affairs. “If you can’t get rid of nightshade, your beans will be crusher beans.” He says that if growers are finding the plant where it should be absent, they need to re-evaluate their weed control program to determine why it was not controlled. Cowbrough suggests that growers first determine whether the initial herbicide was appropriate for controlling eastern black nightshade. If an appropriate herbicide was used, then environmental factors should be reviewed. 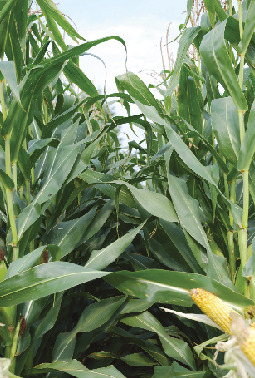 In a given year or field, certain conditions may shorten the period of residual herbicide control, allowing the weed to establish later in the season. Proper sample collection is critical for accurate testing. Specific sampling instructions and submission forms are available at the resistant weeds website: www.plant.uoguelph.ca/resistant-weeds.